Charles Dickens is the best-known novelist in English and, probably, the most famous author in that language after William Shakespeare. Dickens became popular with the publication of his first book in 1837 called ‘The Pickwick Papers’, when he was only twenty-five, and remained a best-selling author throughout his life – his work was as eagerly awaited as J. K. Rowling’s Harry Potter series or Hollywood blockbusters. School children still read him, whether they like it or not, and his works have never been out of print. His characters are some of the most instantly recognisable in all literature but, unlike other fictional celebrities, like Arthur Conan Doyle’s Sherlock Holmes or Gustave Flaubert’s Emma Bovary, they are not the only famous invention of their creators. 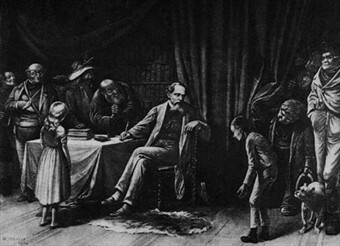 Dickens turned them out month after month: the eccentric deserted bride from ‘Great Expectations’, Miss Havisham; Scrooge and Tiny Tim from ‘A Christmas Carol’, the odious Uriah Heep from ‘David Copperfield’; the detestable Mr. Squeers, surely the most sadistic schoolmaster ever created, in ‘Nicholas Nickleby’; the bloodthirsty Mme. Defarge from ‘A Tale of Two Cities’; the hard-hearted Gradgrind and Bounderby, with their obsession with facts, from ‘Hard Times’; the criminal Fagin in ‘Oliver Twist’, who did not care if his helpless, young pickpockets were hanged. The list could go on and on and on. It’s hard to think of a novelist from any land writing in any language that has turned out so many characters that have become such a familiar part of the literary landscape. Some indeed have influenced the English language itself: ‘scrooge’ is a common name for a miser, for instance. Yet, much of Dickens’ life remains little-known. He was careful with money all his life, as his greatest fear was a return to the poverty that had scarred his childhood; he nearly died in a train accident that gave rise to his greatest short story, ‘The Signal Man’, which will be available in edited form on ReadListenLearn; he had ten children and then left his wife for a woman half his age; and he believed in the supernatural. This is his story. It is perhaps a mark of Charles’ affection for his father, John, that in the novel he has Wilkins Micawber emigrate to Australia and make good in the end. It is also Micawber who exposes Uriah Heep’s fraud in managing his employer’s accounts and thus saves David Copperfield’s friends from ruin. 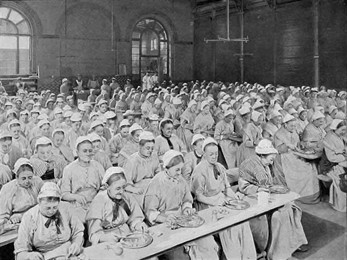 Charles was later sent to school at the very poor Wellington House Academy, run by a sadistic school master. We should not though assume that this was the source for Dickens’ portrait of Wackford Squeers, the odious and criminal schoolmaster of Dotheboys Hall in Yorkshire. Dickens worked as a reporter for a London paper after he completed his school education and spent four years sitting in courts of law listening to terrible stories of injustice so that he could write about them for his paper. Dickens himself said that Squeers was a composite figure based on many schoolmasters he had seen in his travels around the country. At that time, many children from previous marriages were dumped in boarding schools as they were an embarrassment to the happiness of their parent and his new spouse, after the first husband’s or wife’s death. (This happens to David Copperfield when his mother re-marries and he is sent away to school.) If children died from want, disease or downright cruelty, it often made little difference to their parents and was, on occasion, a desired outcome. However, education was not the only target that Dickens took aim at. His many years in the courts convinced him that the object of the law was not to provide justice but to bleed people dry – something that he portrays very well in ‘Bleak House’, where the hero lives in constant hope of wealth from a court case that leaves him with nothing except bitterness and despair. 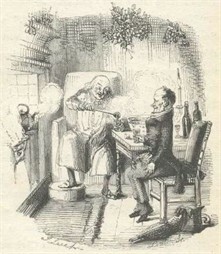 Dickens’ most effective portrait of the moral bankruptcy of the law, though, is in the character of Mr. Jaggers in ‘Great Expectations’, who uses every trick in the book to win cases (although always at a price), regardless of their rights and wrongs. "Kill me sooner than take me there. Throw this pretty child under horses' feet and a loaded wagon, sooner than take him there..."
"'See', cried Madame, pointing with her knife, 'See the old villain bound with ropes. That was well done to tie a bunch of grass upon his back. Ha ha! That was well done. Let him eat it now.’ Madame put her knife under her arms and clapped as at a play." “composed for the most part of the very scum and refuse of London, whose growth was fostered by bad criminal laws, bad prison regulations, and the worst conceivable police." In his personal life, Charles Dickens was a very astute businessman. His contemporary, William Makepeace Thackeray, author of ‘Vanity Fair’, was green with envy that Dickens demanded and got such very high fees for his novels, which he published first in monthly instalments in magazines – some of which he owned himself – and then in book form afterwards. He often worked on the last chapters of a novel at the same time as beginning another. He went on reading tours around Britain and in America, so maximising his sales, in the same way as actors give interviews about their latest films. In fact, when Dickens was on his first tour of America, he presented a signed petition to the President to complain that his works were pirated and he was not receiving any money from their sales. And, of course, he brought out short stories and novellas at Christmas for what he knew was a captive market. None of this is to say, however, that he was mean. He worked hard and gave generously in public causes: hospitals, orphanages and old people’s homes – all moved him to tears and to his wallet. Dickens worked hard and continuously. In fact, his death at the early age of fifty-eight was a direct consequence of being caught in a storm while he was walking and not bothering to dry himself before he sat down to write up the ideas he’d had when he was out. Even when he became so ill because of his public readings in America that he could only eat eggs liquefied in wine, he could not be persuaded to cancel. Never one to give in to illness, on his return to England in 1866, he contracted for a hundred more readings the following year. He managed eighty-seven of them before he collapsed and had to cancel the rest of his tour. 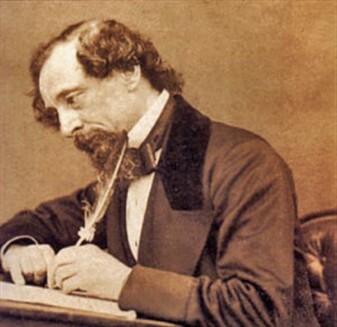 If Dickens worked hard at the business of writing, he also knew how to live life. He wrote several plays for his family and friends to perform at home and threw himself into these amateur productions with all the energy he put into writing his novels. And yet, where his wife, Catherine, was concerned, Dickens had little understanding or sensitivity. She had given him ten children, but when he fell in love with an eighteen-year-old actress, Ellen Ternan, Catherine walked out the door with only one of her children. Her sister chose to stay and look after the others, while the great author continued his affair with his lover. This happened in 1858 after twenty-two years of marriage when Catherine opened a packet to find a gold bracelet and letter to Ellen in it. Catherine never saw her husband again but caused no scandal. Dickens was, as far as we know, not at all grateful for his wife’s silence or saddened by the ending of their relationship. It was only when the last of Dickens’ children died in 1933 that the news of their father’s affair was allowed to become public. It is possible that Dickens had never had the kind of romantic feeling for Catherine that he showed for Ellen Ternan. In fact, early on in his marriage, he seems to have developed a strangely intimate relationship with Catherine’s seventeen-year-old sister, Mary, who lived with the young couple. When Mary died suddenly in 1837, Dickens was inconsolable and even cancelled instalments of ‘The Pickwick Papers’, his first book, and ‘Oliver Twist’ that month. When Charles Dickens died in 1870, he had a single stone to mark his grave, giving only his name and the dates of his birth and death. He wished for his books to speak for themselves. His funeral was private and attended by only twelve close friends and members of his family. He is one of the greatest story-tellers that the world has ever seen.